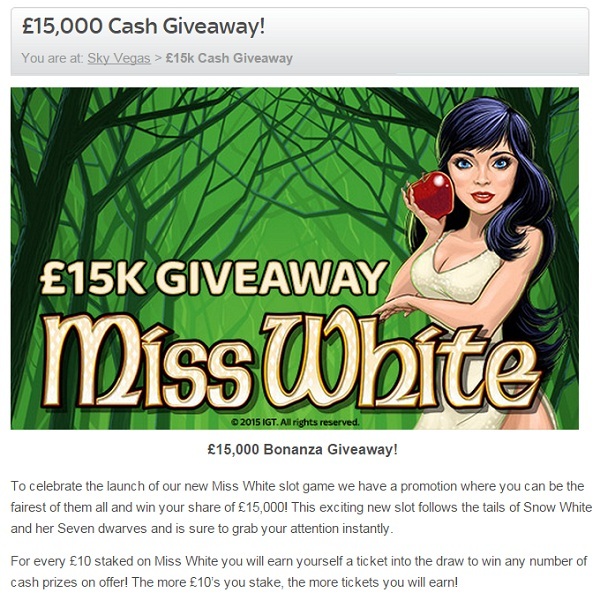 Sky Vegas Casino has just launched a brand new slot, Miss White, and it is celebrating by giving players the chance to win a share of £15,000. For every £10 bet on the new game players will receive an entry to the prize draw. Best of all there is no limit on how many entries each player can receive. The prize draw is taking place on May 6th and there will be a total of five hundred winners. Two hundred players will receive £10 prizes, 150 players will receive £25 prizes, 100 players will receive £50 prizes, 30 players will receive £75 prizes and 20 players will receive £100 prizes. The slot is based upon the story of Snow White and the Seven Dwarves and it is a hugely entertaining game that features 1024 ways to win, expanding symbols, free spins and more.